1. Preheat oven to 400°F. Butter the bottom and sides of two mini tart/quiche pans and dust with bread crumbs (1 Tbsp of crumbs into each). Set aside. 2. In a medium-sized bowl, beat the eggs together; add the milk, salt, and pepper. Add ham and all but 2 Tbsp cheese. 3. Pour egg mixture into the prepared pans and scatter remaining cheese over tops. Bake for 20-25 minutes, or until eggs are set. 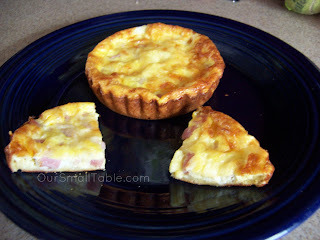 Robyn's notes: this is very close to a Quiche Lorraine, but uses ham instead of bacon (mainly because I had ham in the house I wanted to use up). I'm a big fan of breakfast for dinner, obviously this can be served basically any time of the day. If you do not have mini tart pans, prepare a regular sized pie pan in the same manner and bake for 25-35 minutes, watching for the eggs to set. It may be a much thinner quiche that way, I can't say for sure how far the egg mixture will go in a single large pan. This turned out very well and I'm pleased with it because I always have bread crumbs in the house but rarely have prepared crusts or the energy to make a crust from scratch. Good way to use up Gruyere if you've made Gnocchi Mac n Cheese recently.